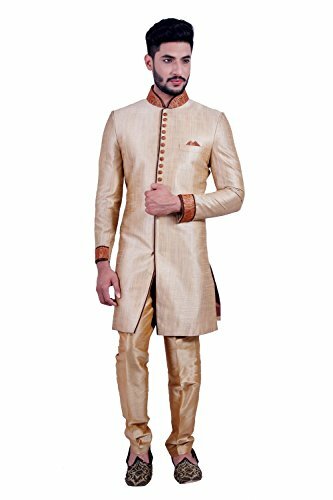 Daffodil Gold Indian Wedding Indo-Western Sherwani for Men | What Should I Say? Gold is great even without the glitter says this matte gold set made in art silk. A crisp slim fit design to suit all body types. The brown buttons and neck line can not go unnoticed. A crisp slim fit design to suit all body types. MAG Men's Handmade Ethnic Traditional Wedding Silk Kurta Pyjama Set - Copper Gold Kurta and White Dhoti 46"